The DHMakerBus Team has a couple of events to let you know about! We are going to be Making at the Western Fair Farmer’s Market May 18th and 25th alongside the Fire Roasted Coffee Folk on the second floor. Come on by and find out about the Maker Movement: participate in our creative tasks: Imagining the Internet and Build a Bus. Learn about the latest in making technology and how we’re going to transform a bus into a mobile technology classroom. Once we’ve got you hooked on the idea, come support us at our Community BBQ Fundraiser. On June 2nd, from 11 – 4, we’ll be in the parking lot at the Western Fair Farmer’s Market with delicious food from Kantina, music from the Blackwood Honeybees, illusions by Steve the Magician, face-painting, and a make-your-own instrument table. Work as a family to create a new friend in our upcycled robot competition! There will also be a technology question and answer table for those with gadget queries! 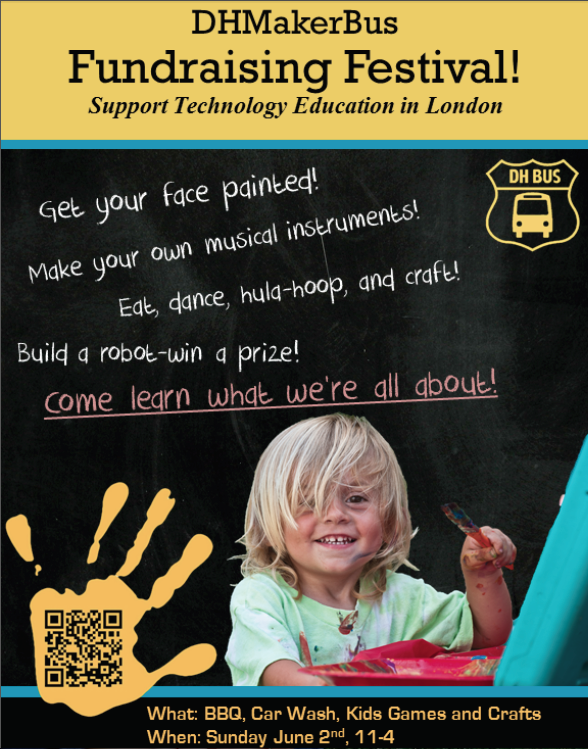 Come learn how you can support technology education in London. Make a difference: #getonthebus!